The dill is winning right now, with a straight flush of all the black swallowtail instars on a single plant. The milkweed is catching up, though. 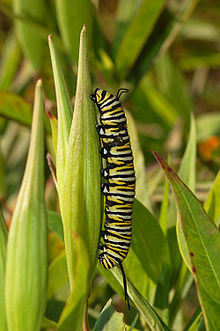 Yesterday I found its ace: a huge monarch caterpillar. And then today, a much smaller one. The milkweed is infested by a giant colony of aphids that I’ve been dabbing with rubbing alcohol, but seems to be thriving anyway. In not-my-garden news, my neighbor cut down his giant honeysuckle bushes, which makes me happy since I’ve been going to the park work days once a month and cutting down honeysuckle. This variety is invasive, and the less of it in my neighborhood, the better. My plants are big enough to remind me what I planted where! Why no, I didn’t use markers or make notes. That takes the surprise out of it. Also including innumerable violets and tiny coneflowers. My garden is going well. I’ve picked a ton of veggies lately. The lettuce is almost done, the carrots are growing, the tomatoes are getting ripe–at least the yellow cherry ones are–I’ve pulled most of the beets. The green beans have been much more productive than expected. I have bush beans, so the plants are pretty small, but heavily loaded. I tried beans once before and the plants hardly grew at all. I’m not sure what’s different this time. 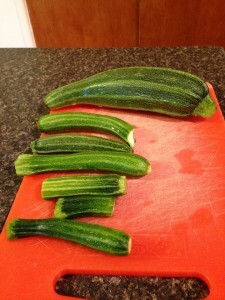 The zucchini have been getting blossom end rot, so I’ve been picking them small. Also in the plan for next year: planting the zucchini next to the lettuce and beets, not by the chard, beans, chives, and parsley. Those little plants are getting shaded. The raspberries ripened and disappeared as fast as they did. Next year, the plant will be much bigger, and we should get berries on some of the very tall canes. Maybe we’ll have better luck getting some berries for ourselves. My purple coneflower is blooming. Saturday I spent an hour or so in the yard sketching my garden. The lines on the flowers are too thick (I need more practice with my brush pens), but I like the way the zucchini leaves turned out. And yes, I planted my coneflower in my vegetable garden. It’s sunny there. Speaking of sun, a few months ago the city took out a tree in strip of our yard between the driveway and the neighbor’s yard. The ground underneath it used to be mulch, daffodils, and a few small weeds that were easy to keep under control. Now, with the extra fun, the weeds are going nuts, to the point where we have to mow them. I’m waiting for the city to plant a new tree before I do anything, but I’ve been thinking about my options. Other than planting grass. When it was shady I’d been thinking of more hydrangeas and Japanese painted ferns. Now I’m considering forsythia and some shrub that will turn bright red in fall. A native wildflower garden is also tempting. It’s been a busy couple months, but at least it’s finally spring. My garden is going strong. We’ve eaten a lot of radishes and lettuce, and a few carrot thinnings. (Did you know the leaves taste like parsley?) The chard and beets struggled to sprout but seem to be doing nicely now. The zucchini, beans, tomatoes, and pepper are flowering, and the carrots have lots of leaves. The volunteer raspberry in the backyard has little green berries that I’m sure will delight the squirrels in a few weeks. Last month I added a potted lingonberry, which has a few small flowers. In April, I took an introduction to drawing class, which was awesome. This month I’m taking landscape drawing. The first class was (obviously) pretty basic, but I learned a lot. Even with the parts I’d read about before, having the instructor there to help makes a huge difference. We’ve only had one week of the landscape class, and it made me appreciate charcoal. We’ll also be using ink (with a brush and bamboo pen) at some point. Of course, I’m just happy for an excuse to sit around outside. I posted this to Twitter et al when it happened, but if you don’t follow me elsewhere, my story “Pictures in Crayon” went up at Cast of Wonders. It’s really neat to hear my words read by someone else. If you’re not an email subscriber to Daily Science Fiction (you should be), you can now read my story “The Girl with Flowers for Hair” on their website. Also, I really like the art they’re displaying today. In other news, it snowed last night and tonight’s low is supposed to be around 20. I have tiny lettuce seedlings that just came up a week or two ago (either from seeds I planted way back in early Sept., or from the lettuce that went to seed). I hope they like snow. Also some self-seeded dill and some chives–I kept tossing chive seeds from my potted plant in the garden for ages. I hope some of these chives will survive so I can ditch the pot. And chard. Always chard. Hopefully until this weekend, at least, when I’ll have a chance to pick it. Though if it’s like last year’s chard it’ll stick around for a while. We’ve eaten three eggplants from the garden, and there’s a tiny fourth one on the plant. Plus more flowers. I don’t know what I did differently this year–moved it to a sunnier spot in the yard, maybe–but I’m happy. This first fruit was unfortunately bitter; the second two I grilled the day I picked them, and they were quite tasty. In other news, my story “Kalar’s Wall” sold to Plasma Frequency, so sometime you’ll be able to read about an attack by an army of giant beetles. Everyone needs a giant beetle story every now and then. In other other news, yes, I still need to blog about my trip. I was sick the whole week after getting back, and this weekend I’ll be at Gen Con, so it’ll be a while. My lettuce is reaching the end of its lifespan. Pretty soon I’ll have to start buying salad greens for lunch. The chard is coming along strong, though. The new seeds I planted in mid-June are growing well (much better than my first batch in early April). We still have a few beets left in the garden. The new radishes got attacked by caterpillars (cabbage worms, I think) but look to be recovering, though not making radishes. We’ve been getting a good amount of yellow cherry tomatoes. The red cherry tomato plant looks like it’ll start getting ripe very soon. And the eggplant has several flowers (crosses fingers). We harvested rhubarb for the first time this year, but only once. I would like to add a second plant. I made a very tiny rhubarb/strawberry cobbler a few weeks ago. Speaking of so many projects, it occurs to me that I don’t talk about writing much on this blog since I stopped doing my Wednesday posts. I’ve been juggling again: I’m procrastinating on the final revisions to one novel by planning another novel, which was going well until I started working on a short story instead. So right now I’m switching off between planning the novel and planning the short story, and feeling guilty about the revisions. The story needs to be done by early August, though (it’s for a contest on a forum I hang out on), so after that I’ll be back down to the two novels, which is a lot easier to juggle. My garden has been very droopy when I come home from work this week. Something about heat and lack of rain, and being planted in pots. So today I went out to water and discovered…baby radishes! Also, baby chard and beets! I planted new seeds…last weekend, I guess, after I pulled up the last five radishes and had space left in a pot. You can see half the lettuce pot on the left (formerly the lettuce and radish pot), and behind that is my eggplant. 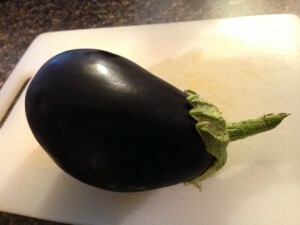 I’m crossing my fingers on the eggplant. 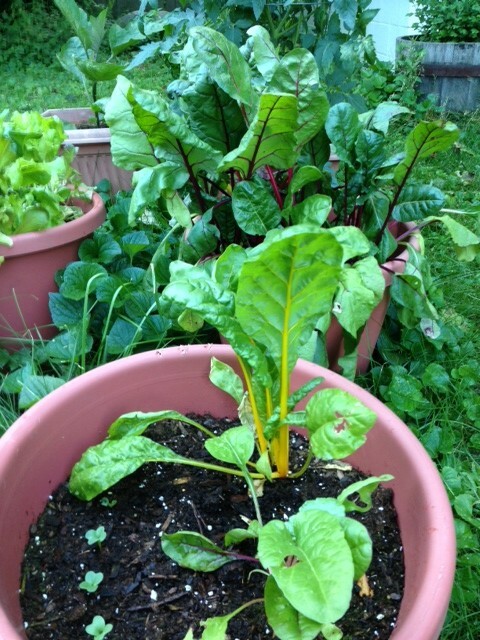 Not shown, because it’s to the left of the front pot in this photo, is the second beet/chard pot. 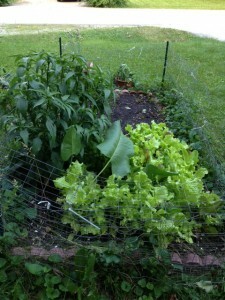 The in-ground garden, with the Extremely Happy Lettuces. Which are interspersed with a few volunteer dill that aren’t really visible. The giant green leaves belong to some native prairie plant that I got a few years ago. I don’t remember what it is. It gets one more leaf every year but so far hasn’t flowered. 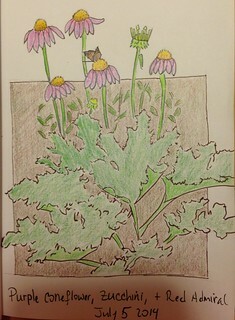 The big bushy green plant is a purple coneflower. What looks like bare dirt is where I planted beets and chard; I have four beets and two or three chards growing, plus a few baby ones from what I planted last week. The pot at the end of the garden is more chard, and you can just barely see my flowering chives to the left of the chard. 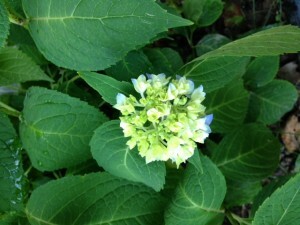 And my new hydrangea is starting to flower. I’m happy to see that it’s blue, not pink. I hope it stays that way. Saturday was a rainy day, so I made soup. Minestrone, which I remembered to start just in time to quick-soak the beans and still have dinner ready by 7. Barely. Minestrone, to me, means “vegetable soup with kidney beans and tomatoes and maybe pasta”. I added potatoes instead of pasta, which made it too thick, but the other definition of soup is “giant pot of things that need to be used before they go bad”. J laughed at me for asking him to buy cabbage, because I keep complaining about all the cabbage we’ve been having. I wanted rolls to go with it, but there wasn’t time to make yeast bread, so I flipped through the Joy of Cooking and ran across a quick beer bread. It’s half white flour and half wheat, plus some oats. I threw in some of last year’s dill and fennel seeds. It turned out really nice, if a little too sweet. Let me interrupt this food post for a garden update. Yesterday, I took advantage of a break in the drizzle to weed my garden and thin the beets, chard, and radishes. They, and the lettuces, are up and growing. Also, several volunteer dill. (I have a feeling we will have dill forever now that I planted it once. I’m just fine with that.) And the chives are huge and getting ready to bloom. The lettuce is still too small to eat, but when I thinned the radishes I discovered they have already started making radishes. The beets have not started making beets. I still need to go buy tomato and eggplant plants. Back to the food notes: I was not about to compost my baby beets, chard, and radishes, so I chopped up the radish roots and tossed them into a skillet with all of the greens and a bit of olive oil and soy sauce and some chopped fresh chives. We each got about half a serving of very tasty veggies.